Daytona Beach is located on the "Fun Coast", and is the primary city in the Deltona-Daytona Beach-Ormond Beach Florida metropolitan area. The city itself sports a population of approximately 65,000, while Greater Daytona's population makes it the 100th biggest metro area in the United States, at a whopping 500,000 residents. Daytona Beach is best known for the Daytona International Speedway, which brings millions of Nascar fans to the city annually to see the Daytona 500. Daytona's history as a haven for motor sports is due to the beach's hand packed sand, which makes the beach perfect for racing. Daytona is the headquarters for NASCAR, and offers many seasonal tourist attractions for racing enthusiasts, including Speedweek, a major annual racing event that occurs every February. Cities included in Daytona metropolitan region include DeBary, Deland, Deltona, Edgewater, Holly Hill, Lake Helen, New Smyrna Beach, Oak Hill, Orange City, Ormond Beach, Pierson, Ponce Inlet, and Port Orange. Daytona locals moving to or from Florida, Moving On Up™ has got you covered. Our moving company is licensed and insured by the Department of Transportation and proud members of the American Moving and Storage Association (AMSA). 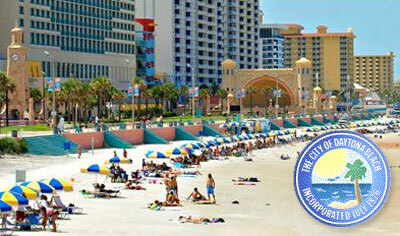 Our moving company performs same-day local moves for relocation anywhere within a 250 miles radius of Greater Daytona. Call us now at 1-800-945-9569 to speak to a moving consultant for more information. Plan your South Florida regional relocation by visiting our packing and moving promotions pages. The dispatch location for Moving On Up™ is conveniently located in nearby Orlando and able to help you with all of your Daytona Beach moving needs. Contact us now at 1 (800) 945-9569 to receive your moving quote by providing your inventory to one of our friendly moving consultants for an accurate, binding price.